I don’t knit, but around the holidays I was given a fantastic sweater knitted by the gift-giver. It’s warm and unique, and just to be in the spirit, I’m wearing it as I write this. Uniqueness, of course, is also an issue in terms of search engine optimization; every page of a website needs to have unique titles, descriptions and content. The website for this month’s SEO Report Card, Agoodyarn.net, does a decent job with unique content, but the site harbors structural issues that are impeding the search engine spiders abilities to crawl the site. Several other issues present themselves as well, though many of them should be easy to clean up. Let’s take a look. I always harp on having a sitemap linked to the home page, and while some sites need it less than others, Agoodyarn.net could benefit from one almost immediately. A sitemap, which is a page that has links to all the major categories an subcategories of a web page, helps search engines through all the sections of a site. It can also be a shopping asset for customers. Almost all of the textual content on the home page is set as link text. Not only does this water down the keyword promotion that the links might garner, but it’s also just plain spammy. While it may not be the webmaster’s intent, this is a form of link stuffing, and it is frowned upon by search engines. The site’s title and logo text, “Fine yarn, classic patterns and odd notions,” are not textual but graphical, and therefore invisible to the search engines. AgoodYarn.net has PageRank of 3 for its home page. This is low, especially considering the domain is 4.5-years-old. Inbound links to the site are decent, with Google showing 253 and Yahoo 2,325. A key issue here is canonicalization. A website should have a single canonical URL, like www.agoodyarn.net. When it has more than one, PageRank is often split between the two URLs. This website has two unique domains: http://www.agoodyarn.net and http://agoodyarn.net are set up as separate entities. One of the two – most likely the non-www version – should be redirected on the server to the other (www.agoodyarn.net) using a 301 Redirect. 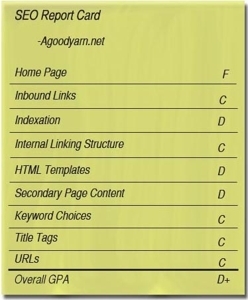 Pages indexed by the three major search engines further point to issues with the dual domains of Agoodyarn.net. Google reports 95 pages for the www site and 241 pages for the non-www site, while Yahoo! sees 142 pages for the www site and 327 pages for the non-www site. MSN Live Search numbers were closer between the two domains at 253 for the www and 332 for the non-www, but these numbers indicate a need to create a single canonical domain for the website. Secondary pages contain decent textual content, but use of tables is outdated and neither looks good nor lends itself to search engine optimization. Keywords are descriptive and ample, though keyword tags tend to be stuffed throughout the site. Only three or four keywords should be the focus of a given web page and appear in the keyword tags. The use of brand names as keywords is fine as it seems that yarn shoppers distinguish by brand. Use of colors and other descriptive attributes of merchandise should be used in tandem with brand names and yarn types. Title tags are important to search engines; they see them as a primary descriptive attribute. While some of AGoodyarn.net title tags are a bit long, they do tend to be unique. Certain key terms are missing in sections of the site. For instance, in the books section, the word “book” rarely appears in the title tags. Every book should have that descriptive word in the title tags. The same goes for Kits and Patterns. While the URLs do not break any major SEO rules, they are also not optimized. Keywords should be reflected in URLs, so that, for example, the Colinette Yarns URL is not www.agoodyarn.net/YRNColinette.htm but http://www.agoodyarn.net/colinetteyarns.htm. If the design of this website is as anywhere as old as the domain itself, it is probably time to invest in a redesign. While the site has a positive ambiance to it and offers a wide range of products, it looks and feels clunky. From an SEO perspective, this redesign could include many upgrades that would give Agoodyarn.net and edge in search engine marketing. If a redesign is not in the cards, the webmaster should immediately pick some of the low hanging SEO fruit: Keywords in URLs, focus the title tags, add keyword rich heading tags, and shorten link text throughout the site.